Crossing from the Mara to the Serengeti (or vice versa) is simple if you are a zebra or wildebeest. Millions of them do this trip every year during what is dubbed the great migration. Things are a little more difficult, though, if you are a human on safari, as getting from Kenya's Masai Mara to Tanzania's Serengeti requires quite a roundabout journey. When you look at a map, it seems so simple. The Tanzania/Kenya border runs between the Serengeti and the Masai Mara, and it should be easy to plan a trip to cross by land. Yet many safari tour operators will tell you it's impossible and you have to fly (via Nairobi or Arusha—which requires backtracking). But go on some of the travel forums, and there are plenty of stories of people crossing a land border. So who is right? You can cross the border just west of the Masai Mara and Serengeti (between Kenya and Tanzania) at a little border post called Isebania. The problem for a tour operator booking a trip is the unforeseen hold-ups at the border post. The journey is also long and bumpy on both sides of the border, it is still a 6-hour drive to get to a camp in the Mara from Isebania. If you are going from Kenya to Tanzania, you'll be forced to spend an overnight in Mwanza on the Tanzanian side. From there it is also at least a half day drive to most Serengeti camps and lodges. So it's certainly not a time-saver and it is debatable if it will save you any money unless you are traveling in a group. Tour operators don't like to offer the land crossing as part of a safari package because it is honestly not a very pleasant trip, but also because vehicles can't cross the borders unless they are registered in both countries (only overland trucks tend to have this type of paperwork). So the tour operator has to have a ground crew in both Kenya and Tanzania to coordinate. If there are delays, or the border is just busy that day, you have two teams on either side waiting for hours not knowing if the clients are lost, or quite when they will show up. Considering flights are not that expensive, and an airline like Safarlink can get you from the Mara to Arusha in just a few hours. Kenya Airways also operates several flights from the Mara, that connect in Nairobi and get you to Arusha in time to continue on to Ngorongoro for the evening. Alternatively, you can enjoy lunch in Arusha, and be in the Mara in time for a sundowner if you fly the "regular" route. You can also fly from smaller airstrips in the Mara to Migori, close to the border. You would then hire a van to take you to Isebania, cross the border on foot, and then get a transfer to Tarime airport for a flight to your Serengeti camp. This avoids the backtracking through Arusha and Nairobi but is also a little complicated for those wanting a stress-free vacation. Namanga, near Amboseli in southeast Kenya, is a better option for those wanting to avoid paying for flights and still wish to enjoy a safari in both countries. 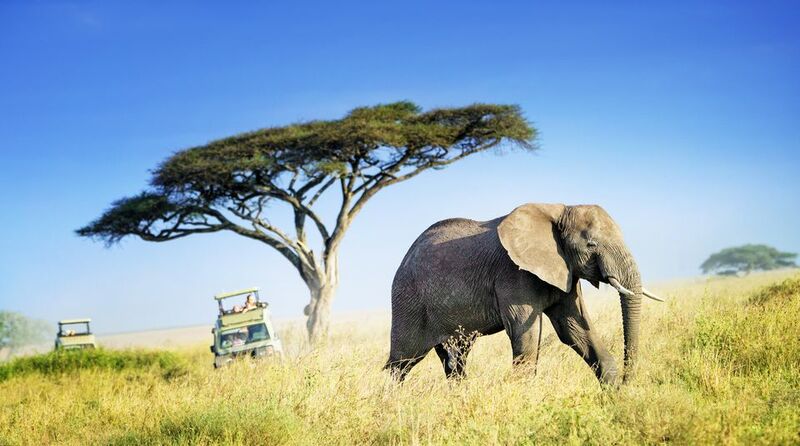 Amboseli is a very popular national park in Kenya, and offers excellent wildlife viewing, for elephants in particular. Namanga is more accessible than Isebania, the roads are better on either side of the border as well, which helps reduce delays. You still have to cross the border on foot to meet your Kenyan or Tanzanian driver, but it is easier to coordinate. It takes just two hours or so from the border to get to Amboseli in Kenya, or two hours to get to Arusha from the border in Tanzania.